So many people have started growing indoors or using grow tents, and they need high-quality LED light systems to make it work. The LED grows light industry is booming, and although they’ve been around for a while, people aren’t getting tired of them. The LEDs are known for incredibly large yields and can be adjusted to increase bud growth and potency. All of this, and at lower energy costs. If you’re aiming to increase yields from your plants while keeping them happy and healthy, LED lights are the way to go. However, many manufacturers make claims they don’t live up to, and the consumer is left with inadequate products. Viparspectra and the Viparspectra reflector series are well known throughout the growing community. But, this is a Chinese product which many questions and avoid because it’s not American made. That’s not fair, as these lights are of decent quality and reasonable price. Technically Viparspectra is a brand, but the company is Shenzhen Bailuo Technology. They work out of China and manufacture LED lights that last for years. This company does well in pricing because they remove the middleman. Instead of heading to a distributors website, they sell their products directly to the consumer. Now, LEDs are becoming less expensive, but Shenzhen Bailuo Technology can stay a step ahead with this advantage. They are available on Amazon at no markup, but other than that you won’t find them at a standard retailer. Overall this company aims to sit comfortably between the top-quality competition and reasonable prices. They keep a focus on using only necessary features and finding the best-LED bulbs. Viparspectra reflector series uses only Bridgelux and Epileds in their light systems. These are well-known LEDs, and their reputation is outstanding. Quality chips and diodes are the recipes that these 2 companies use in designing their LED bulbs. Viparspectra reflector series offers a spectrum that includes infrared as well as 3000K, 7500K. These lights also include 440nm – 730nm. These spectrums are necessary for your plants to grow and thrive. You can use the same lights throughout their lifecycle which is a great benefit and saves you money. The best feature found in any Viparspectra reflector series is the bloom and veg switches. During the plant’s vegetative state, blue light is best. However, during the bloom phase most professional growers switch to a higher red frequency. Although there’s nothing to back up the theory currently, many professional growers are reporting higher yield and better potency when increasing the amount of red light during the bloom phase. The reflector series uses a series of reflectors built surrounding each LED to cascade as much light as possible down into your plants. Penetrating the canopy with the direct light, you have a higher PAR and more intensity. The most popular models in the Viparspectra reflector series are the 600-watt and 450-watt options. However, larger growers or professionals prefer to use a few of the 600-watt series. They typically run cooler and last longer than the larger 900 or 1200-watt models. All of the Viparspectra reflector series lights come with the veg and bloom switches as well as a cooling heat sink, and 4.72-inch fans to keep temperatures low. Be careful in hydroponics growth though because the fans can stir up a lot of the moisture in the room increasing the overall humidity. The Viparspectra warranty comes with all the Viparspectra reflector series options. It’s a simple 3-year warranty that starts counting down from the day you make your purchase. It doesn’t cover any water damage, power surges, issues from hanging, dust build-up, or improper use. The Viparspectra reflector series warranty isn’t a great one, but they do offer an exchange, refund or repair for any warranty claim that does go through. Keep in mind that the Viparspectra reflector series lights usually hold up for a few years, but, if your lights go out, you’re on your own. 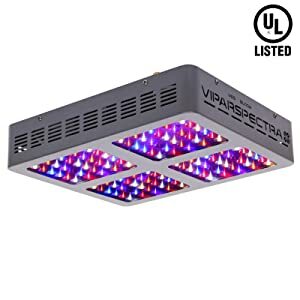 We stated earlier that professional growers prefer to have multiple Viparspectra reflector 600 series instead of the higher wattage 900 or 1200. Putting the model’s side by side, we see that the PAR values significantly, as does their size. Dimensions aren’t the only deciding factor. Many times, multiple units of a smaller light can deliver more consistent lighting than a single larger unit. The best value when we see these units side by side is theViparspectra reflector series 600. Because the PAR is among the highest, and the dimensions are reasonable. There is a double the LED bulbs in the 600 compared to the 300, but the dimensions aren’t doubled. The offset ratio means more LEDs per square inch.